Over the past decade we’ve seen the standard for longhaul flying transition from angled-flat and herringbone seats to reverse herringbone flat beds. A month ago I listed a ranking of my favourite business class hard products flying today. Asia is a joy to fly in and out of when in first or business class, since there’s so much competition between a range of different airlines. However, as the entire industry moves and develops itself, there are some routes that are just stuck behind the times. Most of the time, this is due to structural development, when they need to keep their old planes on certain routes due to their new planes not being rolled out at a quick enough pace. At other times, this is simply due to the logistics of the flight working out when an airline operates a route with an inferior product, where the airline doesn’t feel a need to improve its product on the route due to low yields or excess demand. I thought it’d be fun to point out some of these routes so you guys know which ones to avoid. First of all, this isn’t a list of the worst business class products out there (I’ve heard unanimously bad things about British Airways’ hard product, so you’ll expect a consistently bad experience no matter what – they’re not on the list). I’m focusing on airlines that have done a lot to invest in and advertise a good premium product, but still operate certain flights with an older or inferior product that isn’t half as comfortable. In other words, I’m focusing on airlines with inconsistent premium products, and specifically, I’m exposing the anomalies. Korean Air has one of the most poorly designed airline websites I’ve had the pleasure of using. It’s easy to actually (dummy) book and access flights, though there’s a buffer time upon selecting each seat upon seat selection (you have to wait 8-10 seconds after you select each seat, so you better not misclick), you can’t “cross-reference” cabins (pull up economy and business class fares at the same time), a lot of the time you can’t check-in online because of issues with Korean Air’s website with verifying non-Korean credit cards, and mobile boarding passes rarely work during check-in. It’s a shame, because the onboard experience is exceedingly pleasant, and in quite a few cases, competitive – especially in economy. However, there’s one benefit to Korean Air’s website – it’s very easy to identify which product you’ll be getting (provided there isn’t an equipment swap). The issue is that no one seems to know – I’ve seen so many complaints, even from so-called “travel experts”, when flying Korean Air that they had no idea which product they were getting. I decided I’d write about that in a separate post. When we review flights at Young Travelers of Hong Kong, we attempt to center each review around each specific flight. For that reason, last year we introduced guides, where we’d introduce the product as a whole based on our cumulative experience, as well as other experiences that we’ve read from trusted sources. In this post, I’ll be giving my version of a comprehensive guide to Qatar Airways’ reverse herringbone (A350, A380, 787) and leased A350 business class product. I haven’t flown Qatar’s A330 or A340 (which has a similar configuration to Lufthansa’s A380 business class, though with different finishings and slight structural differences), their old 777 business class (different finishings but otherwise similar to their leased A350) or their brand new 777 QSuites, so I’ll leave them out of this guide. If I do fly them in the future (which is likely, since Qatar will switch to flying their older 777s from Hong Kong for both frequencies later this year), I’ll write a separate guide about these products. Swiss has long offered one of Europe’s business class products, but as people become more open to connections, Swiss is gaining prominence on the map. I’ve heard that their first class product is divine, but it’s been nearly impossible to attain on miles, so you’re pretty much limited to business class if you want to travel on Swiss in a premium cabin (which is pretty attainable on miles, though my parents paid cash for all flights I’ve had on them). Swiss is also in the process of replacing their aged A340 product with their newer 777 product, so their newer product will soon serve as the backbone of their longhaul business class fleet. I’ve had the pleasure of flying Swiss between Hong Kong and Zurich multiple times, and it’s one of the better business class products that I’ve seen thus far. I believe I’m familiar enough with their business class product to put together a comprehensive guide on what you should expect when you book Swiss’ 777 (and soon, their A340) in business class. Over the years, Korean Air’s reputation has risen quite a bit. I’ve had the pleasure of flying Korean Air on shorthaul and longhaul flights, though haven’t had a chance to sample their newest cabin product. Nevertheless, I feel like it’s safe to say that Korean Air is a fine choice – unless you can score their newest 777-300ER or 747-8 business class product, which seems top notch, I don’t think they have one of the world’s best hard products, and some of their amenities could be lacking, though I do enjoy all of my flights on them. 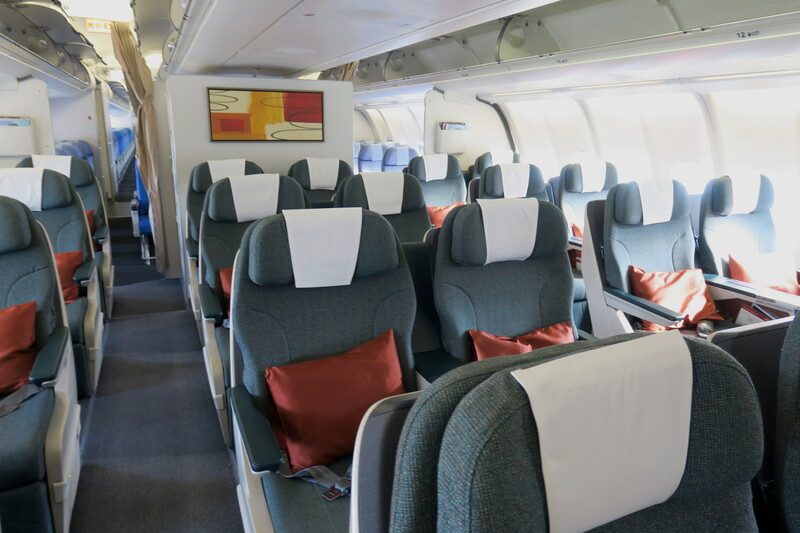 I decided I’d quickly throw together a guide on Korean Air’s business class, as there’s no denying that the popularity of the product is increasing. In all honesty, I’ve been giving the product a pretty hard time, and most business travelers don’t have much flexibility on which flight they can take, especially when there’s only one flight a day and it’s operated by a regional cabin. So I’ve decided it would be good to compile a quick guide on how the product is, and the perks you’ll get compared to if you’re seated in economy (apart from not getting cramped into a 3-4-3 configuration).